The property is a modern 2 bed (sleeps 5) detached house with a private pool. It is situated in one of the most sought after areas of Kato Paphos and is an easy 20 minute walk to the harbour, bars, restaurants, beaches or the old town. It is a short walk to the supermarket and there is a 24-hour convenience store just around the corner (3 minutes walk). The property has a Lounge/Dining room, fitted kitchen, downstairs WC, and two en-suite bedrooms, one double and one twin with an extra pull out bed if required. 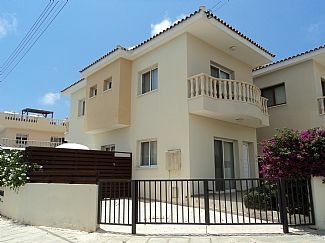 The property is fully air-conditioned and has English TV and WiFi included. En-suite to bedroom one consists of shower, wc and wash hand basin. En-suite to bedroom two consist of bath with fixed overhead shower, wc and wash hand basin. Downstairs there is a guest wc and wash hand basin. All linen is proved for your stay. There is wifi available at the house and is included in the rental. All towel are provided for your stay including beach towels. Kitchen is fully fitted with an oven and ceramic hob, fridge/freezer, washing machine, dishwasher, microwave, kettle, toaster, coffee machine and sandwich maker. There is satellite tv available which is capable of receiving all main English channels plus sky included in the rental. There are a few board games for your entertainment. There is a large selection of DVD's for you to watch. The pool is approximately 4 x 8 meters in size. Notes on accommodation: The property has good natural lighting throughout. The whole of the ground floor and the bedrooms are fitted with fly screens. Outside: The property is fully enclosed with a private swimming pool and shower. There is patio furniture, sun loungers, barbecue, clothes line and drying rack. To the front of the property there is a small garden with patio area. Cleaning / Towels / Linen / Maid service: All towels, (hand,bath & beach towels for 5 people) and bedlinen are included. The apartment will be cleaned prior to your arrival. If you require a mid stay clean then this can be arranged at an extra cost. Other: Also available in the property if required are an iron and ironing board, vacuum cleaner, travel cot and high chair, books, games and DVDs. The villa is in walking distance to the harbour, bars and restaurants, which is not too far as we had a 2yr old that walked no problem. The house was very clean and had all amenities that you would need to enjoy your holiday. The pool was used daily especially by the children and was also warm enough for the baby. I would definitely recommend my family and friends to stay here and would definitely stay again myself. Scuba diving is available at the harbour. There are many architectural sites around Paphos and all over the Island. There is a waterpark, go karting and a Bird Park close to Paphos centre. Numerous water sports are available along the sea front. Other activities include extreme cycling, jeep safaris, horse riding and trekking in the Troodos Mountains and other national parks. The property is within 20 minutes easy walking to the beach and harbour. Paphos airport is 20 minutes drive away. Larnaca is an hour and a half away. Taxis are plentiful from Paphos airport. Car hire is available if required. There are numerous mountain villages, small towns and places of interest within easy travel distance from Paphos. Although there is a decent, inexpensive bus service it may be advisable to hire a car if you intend to do a lot of site seeing.